The Don Walker Memorial Scholarship awards at least $2,000 in scholarships annually to students at Marquette University or the University of Wisconsin-Milwaukee who are pursuing a career in journalism. The scholarship is administered by the Milwaukee Press Club Endowment. Before completing your online donation, you’ll come to a review page. On this page, under “MPC Endowment Ltd” there’s an option to “add special instructions to seller.” Please click that and type in “Don Walker Scholarship” so your donation gets to the proper fund within the endowment. The Don Walker Memorial Scholarship would not have been possible without its leadership sponsors. Please click here to learn more. 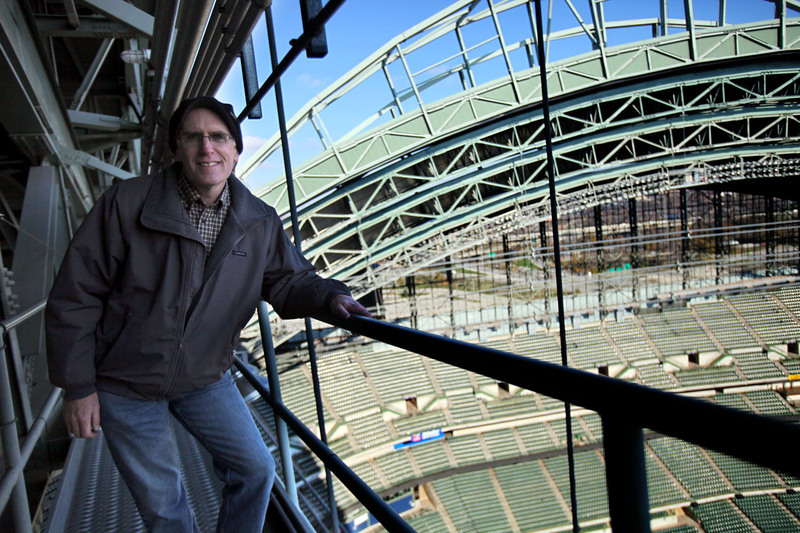 Don Walker pauses for a photo on the catwalk during a tour of Miller Park, home of the Milwaukee Brewers. Photo courtesy of Sue Walker. The MPC Endowment Ltd. is a 501(c)(3) Wisconsin-registered non-stock corporation. It was established in 1973 to promote journalism excellence and is run by an elected board of directors that includes a president, vice president, treasurer, secretary and five directors. Board members are elected by Milwaukee Press Club members but operate independently of the club and maintain separate finances. Donations are tax deductible to the fullest extent of the IRS regulations.